Trivedi, MK., et al. Immunomodulatory Effect of the Biofield Energy Treated Cell Growth Medium (DMEM) and FBS in Immune Cells (Murine Macrophage RAW 264.7). (2018) J Cell Immunol Serum Biol 3(2): 1- 5. © 2018 Trivedi, MK. This is an Open access article distributed under the terms of Creative Commons Attribution 4.0 International License. The objective of the present study was to evaluate the immunomodulatory effect of Biofield Energy Treatment (The Trivedi Effect®) on Dulbecco’s Modified Eagle’s Medium (DMEM) and fetal bovine serum (FBS) in murine macrophage cells (RAW 264.7). The study parameters were evaluated using cell viability by MTT assay and estimation of proinflammatory cytokine like tumor necrosis factor - alpha (TNF-α) on immunomodulation using enzyme linked immune sorbent assay (ELISA). The cell viability using MTT assay data showed that more than 80% cell viability was observed in all the tested groups compared to the baseline control group (G1). 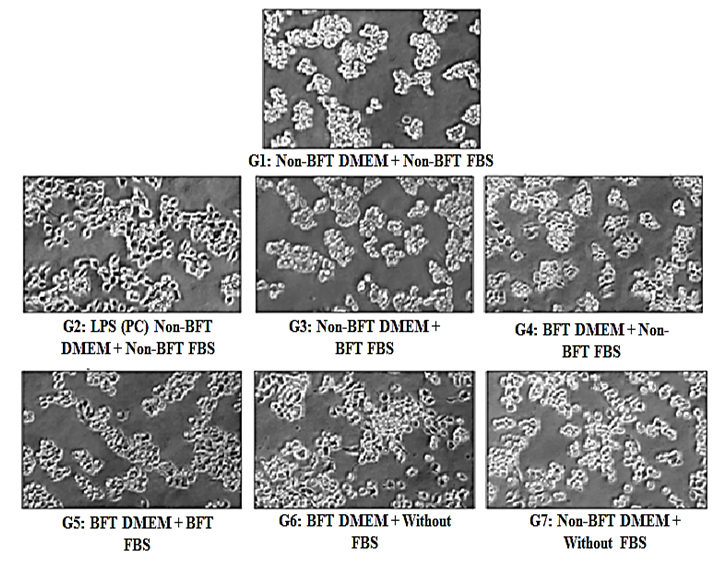 The characteristics of cell morphology in the Biofield Energy Treated DMEM without FBS (G6) group showed some changes in the cell morphology as evidenced a transition from spherical to elongate and also showed maturation compared to the G1 group. The level of TNF-α expression was significantly reduced by 23.15% in the G3 group compared to the G1 group. Moreover, the secretion of TNF-α was altered by 38.06%, 35.77%, and 282.49% in the G4, G5, and G6 groups, respectively compared to the G1 group. The overall results demonstrated that the Trivedi Effect® - Consciousness Energy Healing Treatment has an impact on DMEM and FBS by alteration of cell morphology and reducing the level of TNF-α expression in immune cell (RAW 264.7). Therefore, the Trivedi Effect® treated DMEM and FBS might be useful as an immunomodulator for various immune-related disorders like Graves’ disease, rheumatoid arthritis, multiple sclerosis, etc. A suitable nutrient-based medium is always required for the growth of cells. All cells do not have the same requirements for growth and survival. In this aspect, for successful growth, maintenance and expression of differentiated metabolic functions in vitro, an appropriate culture conditions are required, which mimic the physiological conditions in vivo and in situ. In fact, it is well known that, serum supplement like fetal bovine serum (FBS) represents a fundamental source of nutrients, cytokines, and adhesive molecules necessary for in vitro cell growth, metabolism, and to stimulate the cell proliferation[1,2]. In general circumstance, an alteration of an immune system in any living system is mediated through the secretion of key cytokines such as tumor necrosis factor - alpha (TNF-α), interleukin (IL)-1β, and macrophage inflammatory protein (MIP)-1α. Thymus derived lymphocyte helper cell 1 (TH1) is the primary sources for IL-1β, TNF-α, IL-2, interferon-ϒ (IFN-ϒ), lymphotoxins and other factors, which characterize the cell-mediated immune responses. The different type of immune cells such as dendritic cells (DCs), macrophages, and spleen can play as an important role in order to stop the acute/chronic inflammation and retrieve a steady state strategy through the secretion of immuno-modulating cytokines. In this study, the cytotoxic effect of the Biofield Energy Treated medium and FBS was screened by assessing the metabolic activity of immune cells using MTT assay. MTT assay is rapid, cost-effective, less time consuming, and non-radioactive type of method, which was previously proven to show the similar pattern of result in cell proliferation as the bromodeoxyuridine (BrdU) assay. In the current global scenario, Energy Therapy like Biofield Energy Healing has been widely used and recommended as an alternative method that has an impact on various properties of living organisms in a cost-effective manner. The Trivedi Effect® - Biofield Energy Healing has been known to improve the potential beneficial effects in a broad spectrum field around the Globe. It improved the overall productivity of crops in agriculture and livestoc[7-10], positive impact on cancer[11,12], and altered characteristics features of microbes in the field of microbiology[13-16]. It also altered the structural, physical, and thermal properties of several metals and ceramics [17-19], causes chromosomal changes in microbes[20,21], and improved various nutraceutical compounds in the areas of nutraceuticals[22,23] and biotechnology[24-26]. Many therapeutic aspects are available for the proliferation and differentiation of macrophages cells by means of some chemical treatment. The aim of the present study was to develop a potential culture medium for the efficient growth and differentiation of macrophage cells (RAW 264.7). The macrophages (RAW 264.7) culture and to investigate the influence of Biofield Energy Treated Dulbecco’s Modified Eagle’s Medium (DMEM) and FBS in comparison to cell viability, morphology, and estimation of cytokine - TNF-α. Antibiotics solution (penicillin-streptomycin) and DMEM (phenol-red free) were procured from HiMedia, India. DMEM was procured from GIBCO, USA. Direct Red 80, 3-(4, 5-dimethyl-2-thiazolyl)-2, 5-diphenyl-2H-tetrazolium) (MTT), and lipopolysaccharide (LPS; positive control) were purchased from Sigma Chemical Co. St. Louis, MO, USA. All the other chemicals used in this experiment were analytical grade procured from the India. Murine macrophage cell line, RAW 264.7 was procured from The National Centre for Cell Science (NCCS), Pune, India, used as the test system in the present study. Macrophage cell line was maintained under DMEM supplemented with 10% FBS for routine culture. Growth conditions were maintained at 37°C, 5% CO2, and 95% humidity and sub-cultured by tapping the flask and splitting the cell suspension into fresh flasks and supplementing with fresh cell growth medium. The DMEM growth medium and FBS were subjected to Biofield Energy Treatment (The Trivedi Effect®) under standard laboratory conditions for ~3 minutes from a distance of ~25 cm. The energy transmission was done without touching the medium and FBS. Following Biofield Energy Treatment, the DMEM and FBS were used for culture of macrophage cells. The tested cells were divided into seven groups. 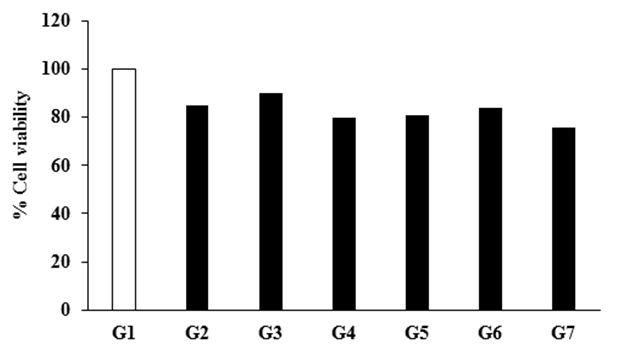 Group (G) 1 served as baseline control (untreated DMEM and FBS). G2 served as positive control (LPS-50 ng/mL). G3 includes Biofield Energy Treated FBS with untreated DMEM andG4 contained Biofield Energy Treated DMEM with untreated FBSG5 defined as both Biofield Energy Treated DMEM and FBSG6 referred as Biofield Energy Treated DMEM without FBS and G7 consisted with untreated DMEM without FBS. The effect of the Biofield Energy Treated and untreated DMEM and FBS on the production of TNF-α was measured by ELISA method using culture supernatants. Briefly, the ELISA plates were coated overnight and kept at 4°C with coating buffer containing capture antibody at the recommended concentration. After washing with phosphate buffer saline (PBS)-T (PBS with 0.05% Tween 20), the plates were blocked with assay diluent for at least 2 hours at room temperature (RT). About 100 μL of culture supernatant from different experimental samples and standards were incubated overnight at 4°C and, after three washes, the biotinylated anti-mouse cytokine (i.e., TNF-α) antibodies at the recommended concentrations were incubated for 1 hour, at RT and the plate was incubated for 45 minutes at RT with gentle shaking. Plates were again washed 3 times and then 100 μL of horseradish per-oxidase (HRP)-streptavidin conjugate solution was added, and the plate was incubated for 45 minutes at RT with gentle shaking in a shaker. Next, the plate wells were washed 3 times and 100 μL of 3, 3, 5, 5'-tetramethylbenzidine (TMB) was added to the wells followed by 30 minutes incubation at RT in dark condition. Then 50 μL of 0.2 mol/L sulphuric acid was added to each well to stop the reaction. After that, the plates were read for absorbance at 450 nm using a Biotek reader (SIAFRT/Synergy HT multimode reader). Positive control was run in parallel to the samples. Concentrations were determined, and the experiment was done in triplicates. Data analysis was performed with Sigma Plot Statistical Software (Version 11.0). Differences between means (in triplicates) were assessed for the statistical differences using Student’s t-test (between two groups) and for multiple comparison one-way analysis of variance (ANOVA) and post-hoc analysis was done by Dunnett’s test. P ≤ 0.05 was considered as statistically significant. The results are shown as mean ± standard error of mean (SEM). RAW 264.7 cells were exposed with the Biofield Energy Treated DMEM and FBS for 24 hours. The cell viability was assessed by MTT assay is shown in Figure 1. All the tested groups resulted approximately >80% cell viability compared to the baseline control group (G1) and hence, was considered as non-cytotoxic for cytokine estimation. Besides, cell morphology is demonstrated in Figure 2. G1 group (untreated DMEM and FBS) demonstrated a spherical morphology with semi-adherence to surface, which was typical characteristic of RAW264.7 cells G2 group (LPS + untreated DMEM + untreated FBS) showed maturation of macrophages. Elongated cells attached to surface were observed. Biofield Energy Treated groups such as G3 (untreated DMEM + Biofield Energy Treated FBS), G4 (Biofield Energy Treated DMEM + untreated FBS), and G5 (Biofield Energy Treated DMEM + Biofield Energy Treated FBS) showed no significant changes with respect to the control group (G1). Additionally, G6 group (Biofield Energy Treated DMEM without FBS) showed changes in cell morphology, like a transition from spherical to elongate and attached morphology of cells was observed, showing maturation. Further, G7 group (untreated DMEM without FBS) showed no significant changes from control group (Figure 2). Figure 1: Effect of the Biofield Energy Treatment on the viability of RAW264.7 cells measured after 24 hours. G1: Baseline control (untreated DMEM and FBS); G2: Positive control (LPS-50 ng/mL); G3: Biofield Energy Treated FBS with untreated DMEM; G4: Biofield Energy Treated DMEM with untreated FBS; G5: Both Biofield Energy Treated DMEM and FBS; G6: Biofield Energy Treated DMEM without FBS; and G7: Untreated DMEM without FBS. Figure 2: Effect of the Biofield Energy Treatment on cellular morphology of RAW264.7 cells captured after 24 hours. BFT: Biofield Energy Treatment; LPS (PC): Lipopolysaccharide (positive control). The effect of the Biofield Energy Treatment on DMEM and FBS for the secretion of TNF-α in RAW 264.7 cells is depicted in Figure 3. The label of TNF-α was 262.2 ± 13.49 pg/mL in the baseline control group (G1). Further, it was significantly (p ≤ 0.001) increased by 1057.82% in the positive control (LPS - 50 ng/mL) group (G2) compared to the G1 group. The expression of TNF-α was significantly reduced by 23.15% (p ≤ 0.01) and 39.70% (p ≤ 0.001) in the G3 and G7 groups, respectively with respect to the G1 group. Moreover, the secretion of TNF-α was altered by 38.06%, 35.77%, and 282.49% in the G4, G5, and G6 groups, respectively compared to the G1 group. RAW 264.7 cells, derived from monocyte/macrophage were cultured in the Biofield Energy Treated DMEM and FBS. The concentration of TNF-α in cell culture media was determined by ELISA-TNF-α immunoassay. In conventional mechanistic aspect, macrophages regulates the immune response by releasing proinflammatory cytokines such as TNF-α, IL-1, and IL-6. However, overproduction of these cytokines, became detrimental, which prolonged the inflammation and aggravate tissue damage[27-30]. The level of TNF-α was remarkably increased in the G2 group compared to these G1 group, which was due to exposure to LPS (viruses or bacterial endotoxins). Because the activated macrophages are the major source of cytokines and increased the level of cytokine gene expression by LPS and involves the action of several families of transcription factors, including members of the nuclear factor-κB (NF-κB) and consisting rel protein, CCAAT-enhancer-binding proteins (C/EBP), erythroblast transformation- specific (Ets) protein, and activator protein 1 (AP-1) families. Induction of proinflammatory cytokine expression is critical for a rapid response against tissue trauma or infection. For example, as TNF-α is too cytotoxic, an increase over expression causes various serious pathological conditions such as septic shock, acute inflammation, cachexia, autoimmune disease, and Alzheimer’s syndrome[32-34]. In United State, approximately 175,000 deaths had been reported per year due to only septic shock. In this experiment, the level of proinflammatory cytokine (TNF-α) was significantly reduced by 23.15% in the Biofield Energy Treated FBS group(G3). Rest of the treated groups showed a significantly alteration the expression of TNF-α compared to the baseline control group (G1). Based on the outcome it is assumed that Mr. Trivedi’s Consciousness Energy Healing Treatment has an impact on FBS to inhibit the secretion of proinflammatory cytokine like TNF-α. Thus, the Biofield Energy Treated FBS would be more beneficial to maintain a healthy grown culture medium in the areas of in vitro cell culture technique. 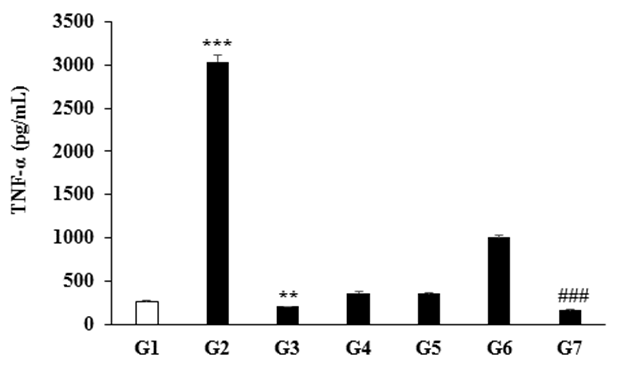 Figure 3: Effect of the Biofield Energy Treatment on the secretion of TNF-α in RAW264.7 cells measured after 24 hours. G1: Baseline control (untreated DMEM and FBS); G2: Positive control (LPS-50 ng/mL); G3: Biofield Energy Treated FBS and untreated DMEM; G4: Biofield Energy Treated DMEM and untreated FBS; G5: Biofield Energy Treated DMEM and FBS; G6: Biofield Energy Treated DMEM without FBS; and G7: Untreated DMEM without FBS. ***p ≤ 0.001 vs. baseline control group-G1 (using one-way ANOVA). **p ≤ 0.01 and ###p ≤ 0.001 vs. G1 group (using Student’s t-test). The present study was conducted to evaluate the effect of Biofield Energy Treatment (The Trivedi Effect®) on DMEM and FBS for the assessment of TNF-α secretion in macrophage cells (RAW264.7). All the treatment groups demonstrated no adverse effects on cell viability with relation to the baseline control group(G1). However, all the tested groups showed >80% cell viability compared to the baseline control group (G1). Besides, the Biofield Energy Treated DMEM without FBS group (G6) showed some changes in the cell morphology as evidenced a transition from spherical to elongate and also showed maturation of cells compared to the G1 group. The level of TNF-α expression was significantly reduced by 23.15% in the Biofield Energy Treated FBS group (G3) with respect to the G1 group. In conclusion, The Trivedi Effect® - Consciousness Energy Healing Treatment might impact on DMEM and FBS by alteration of cell morphology and reducing the level of TNF-α expression in immune cell (macrophage RAW 264.7). Therefore, it can be useful as an immunomodulator for various immune-related disorders viz. multiple sclerosis, lupus, vasculitis, scleroderma, various types of hemolytic anemia, diabetes (type-1), graves’ disease, rheumatoid arthritis, etc. in the near future. Authors gratefully acknowledged to Trivedi Global, Inc., Trivedi Science, Trivedi testimonials and Trivedi master wellness for their support. In addition, authors are also thankful for the support of Dabur Research Foundation for conducting this study. 1. Bettger, W.J., McKeehan, W.L. Mechanisms of cellular nutrition. (1986) Physiol Rev 66:1-35. 2. Kumar, R.K., O’Grady, R., Li, W., et al. Primary culture of adult mouse lung fibroblasts in serum-free medium: Responses to growth factors. (1991) Exp Cell Res 193: 398-404. 3. Chen, K., Jay, K., Kolls, T. Cell–Mediated host immune defenses in the lung. (2013) Annu Rev Immunol 31: 605-633. 4. Mosmann, T.R., Sad, S. The expanding universe of T-cell subsets: Th1, Th2 and more. (1996) Immunol Today 17: 138-46. 5. Durrieu, G., Maury-Brachet, R., Girardin, M., et al. Contamination by heavy metals (Cd, Zn, Cu, and Hg) of eight fish species in the Gironde estuary (France). (2005) Estuaries 28: 581-591. 6. Yount, G., Patil, S., Dave, U., et al. Evaluation of biofield treatment dose and distance in a model of cancer cell death. (2013) J Altern Complement Med 19: 124-127. 7. Trivedi, M.K., Branton, A., Trivedi, D., et al. Morphological and molecular analysis using RAPD in biofield treated sponge and bitter gourd. American Journal of Agriculture and Forestry. (2015) 3: 264-270. 8. Trivedi, M.K., Branton, A., Trivedi, D., et al. Effect of biofield energy treatment on chlorophyll content, pathological study, and molecular analysis of cashew plant (Anacardium occidentale L.). (2015) Journal of Plant Sciences 3: 372-382. 9. Trivedi, M.K., Branton, A., Trivedi, D., et al. Molecular analysis of biofield treated eggplant and watermelon crops. (2016) Adv Crop Sci Tech 4: 208. 10. Trivedi, M.K., Branton, A., Trivedi, D., et al. Effect of biofield treated energized water on the growth and health status in chicken (Gallus gallus domesticus). (2015) Poult Fish Wildl Sci 3: 140. 11. Trivedi, M.K., Patil, S., Shettigar, H., et al. The potential impact of biofield treatment on human brain tumor cells: A time-lapse video microscopy. (2015) J Integr Oncol 4: 141. 12. Trivedi, M.K., Patil, S., Shettigar, H., et al. In vitro evaluation of biofield treatment on cancer biomarkers involved in endometrial and prostate cancer cell lines. (2015) J Cancer Sci Ther 7: 253-257. 13. Trivedi, M.K., Branton, A., Trivedi, D.,et al. Antibiogram pattern of Shigella flexneri: Effect of biofield treatment. (2015) Air Water Borne Diseases 3: 122. 14. Trivedi, M.K., Patil, S., Shettigar, H., et al. Antimicrobial susceptibility pattern and biochemical characteristics of Staphylococcus aureus: Impact of biofield treatment. (2015) J Microb Biochem Technol 7: 238-241. 15. Trivedi, M.K, Branton, A., Trivedi, D., et al. Effect of biofield energy treatment on Streptococcus group B: A postpartum pathogen. (2015) J Microb Biochem Technol 7: 269-273. 16. Trivedi, M.K., Patil, S., Shettigar, H., et al. Phenotypic and biotypic characterization of Klebsiella oxytoca: An impact of biofield treatment. (2015) J Microb Biochem Technol 7: 202-205. 17. Trivedi, M.K., Nayak, G., Patil, S., et al. An evaluation of biofield treatment on thermal, physical and structural properties of cadmium powder. (2015) J Thermodyn Catal 6: 147. 18. Trivedi, M.K., Nayak, G., Patil, S., et al. Effect of biofield energy treatment on physical and structural properties of calcium carbide and praseodymium oxide. (2015) International Journal of Materials Science and Applications 4: 390-395. 19. Trivedi, M.K., Tallapragada, R.M., Branton, A., et al. Characterization of physical, thermal and structural properties of chromium (VI) oxide powder: Impact of biofield treatment. (2015) J Powder Metall Min 4: 128. 20. Trivedi, M.K., Branton, A., Trivedi, D., et al. Antimicrobial susceptibility, biochemical characterization and molecular typing of biofield treated Klebsiella pneumoniae. (2015) J Health Med Inform 6: 206. 21. Trivedi, M.K., Branton, A., Trivedi, D., et al. Antibiogram, biochemical reactions, and genotypic pattern of biofield treated Pseudomonas aeruginosa. (2015) J Trop Dis 4: 181. 22. Trivedi, M.K., Tallapragada, R.M., Branton A, et al. Biofield treatment: A potential strategy for modification of physical and thermal properties of gluten hydrolysate and ipomoea macroelements. (2015) J Nutr Food Sci 5: 414. 23. Trivedi, M.K., Nayak, G., Patil, S., et al. Bio-field treatment: An effective strategy to improve the quality of beef extract and meat infusion powder. (2015) J Nutr Food Sci 5: 389. 24. Trivedi, M.K., Branton, A., Trivedi, D., et al. Physicochemical and spectroscopic characterization of biofield energy treated gerbera multiplication medium. (2015) Plant 3: 57-63. 25. Trivedi, M.K., Branton, A., Trivedi, D., et al. Physical, spectroscopic and thermal characterization of biofield treated fish peptone. (2015) Eur Biophys J 3: 51-58. 26. Trivedi, M.K., Branton, A., Trivedi, D., et al. Physicochemical characterization of biofield treated orchid maintenance/replate medium. (2015) J Plant Sci 3: 285-293. 27. He, H., Li, W., Chen, S.Y., et al. Suppression of activation and induction of apoptosis in RAW264.7 cells by amniotic membrane extract. (2008) Invest Ophthalmol Vis Sci 49: 4468-4475. 28. Xaus, J., Comalada, M., Valledor, A.F., et al. LPS induces apoptosis in macrophages mostly through the autocrine production of TNF-alpha. (2000) Blood 95: 3823-3831. 29. Tracey, K.J., Cerami, A. Tumor necrosis factor: A pleiotropic cytokine and therapeutic target. (1994) Annu Rev Med 45: 491-503. 30. Akira, S., Taga, T., Kishimoto, T. Interleukin-6 in biology and medicine. Adv Immunol 54: 1-78. 31. Sweet, M.J., Hume, D.A. Endotoxin signal transduction in macrophages. (1996) (1993) J Leukoc Biol 60: 8-26. 32. Meda, L., Cassatella, M.A., Szendrei, G.I., et al. Activation of microglial cells by beta-amyloid protein and interferon-gamma. (1995) Nature 374: 647-650. 33. Schattner, A. Lymphokines in autoimmunity- A critical review. (1994) Clin Immunol Immunopathol 70: 177-189. 34. Tracey, K.J., Cerami, A. Tumor necrosis factor: A pleiotropic cytokine and therapeutic target. (1994) Annu Rev Med 45: 491-503. 35. 35. Stone R (1994) Search for sepsis drugs goes on despite past failures. Science 264: 365-367.